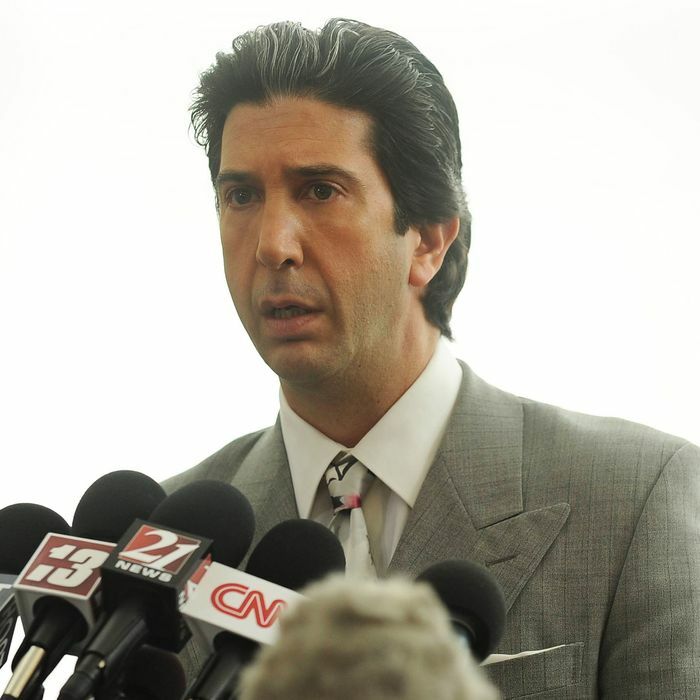 David Schwimmer as Robert Kardashian. So says Robert Shapiro after discovering, to his surprise, that his client has not killed himself and is currently leading the police on a slow-speed chase up and down a Los Angeles freeway. After reading what appeared to be his suicide note — signed with a deranged/whimsical smiley face in the O — Shapiro and Robert Kardashian both assumed O.J.’s disappearance was the prelude to his end. That certainly seems to be a real option for O.J., who is sitting in the back of the white Bronco with a gun to his head, effectively neutralizing any effort to pursue him more aggressively. As it happened on June 17, 1994, the rolling standoff paralyzed the entirety of L.A., cleared the freeway like a Hollywood set, and mesmerized Americans across the country, who watched it unfold for hours on television. Two decades later, the Bronco chase remains bizarre and surreal. And though it became the first of many cultural Rorschach tests on O.J.’s guilt or innocence, no lawyer would ever advise his or her client to become a fugitive from justice — it simply doesn’t seem like the behavior of a stable, grief-stricken man. But in that moment, Shapiro recognizes that O.J. had inadvertently changed the narrative. Who could possibly think about Nicole Brown Simpson and Ronald Goldman during that chase? People were focused on O.J., marveling at the spectacle and wondering when and how it was going to end. The seeds of a “not guilty” verdict were planted on June 17, 1994; the case was suddenly so much bigger than a double murder. It became a full-blown cultural phenomenon, which made it easier for Shapiro and his team — with the media aiding and abetting — to convince jurors this was more than an ordinary crime of passion. They were not just “in the game.” They were winning. Lifting its title from the Jeffrey Toobin book on which The People v. O.J. Simpson is based, “The Run of His Life” devotes its entire hour to the Bronco chase and the conflagration of forces around it. The show shrewdly re-creates the mind-clearing experience of watching it happen at the time, but this effect lulls more than it grips. Even the major players on the defense and prosecution are shown gathered around TV sets, caught in slack-jawed stupor. It was never boring to watch, exactly, but it soon became clear to viewers at home that a conclusion wasn’t imminent — they could order pizza or eye the box-in-screen broadcast of the Rockets-Knicks game without missing any action. Something would have to happen eventually. (It was like one of those cop shows with overhead views of police chases, but drawn out to agonizing length.) The chase set the tone for the trial itself: absurdly long yet mesmerizing. It was America’s favorite background noise. Without referencing it directly, “The Run of His Life” also tips its hat to Brett Morgen’s June 17, 1994, the best and most innovative of ESPN’s “30 for 30” series. The day of the chase happened to coincide with one of the busiest days in sports history: Game 5 of the NBA Finals, Arnold Palmer’s final appearance at the U.S. Open, the opening ceremony of the World Cup in Chicago, the New York Rangers celebrating a Stanley Cup victory, and Ken Griffey Jr. tying Babe Ruth for the most home runs hit before June 30. The genius of Morgen’s documentary is that it’s all montage: no chatter other than the live commentary over the events themselves. It’s a great act of media criticism — in the A.V. Club, my friend Noel Murray compared it to Negativland’s album Dispepsi, a deconstructionist critique of soda commercials — and it succeeds in re-creating the experience of watching TV on that incredible day. As a scripted series, The People v. O.J. Simpson has the freedom to show us all the drama we weren’t seeing on television that day, so there’s plenty of that in “The Run of His Life,” too. We check in on District Attorney Gil Garcetti, whose humiliation is magnified by Bruce Greenwood’s megaphone of a voice. (“If it were our absolute goal, could we look more incompetent? This is the worst day of my life. It’s worse than the day I was diagnosed with cancer.”) The chase deepens Garcetti and Marcia Clark’s resolve to bring the hammer down on O.J., but we can see signs in these early moments that prosecutorial zeal won’t necessarily work to their long-term benefit. While it’s true that the resources of the district attorney’s office will be dwarfed by those of O.J.’s defense team, there’s a sense already that they’re overplaying their hand. On the O.J. side, the episode reveals a fascinating split between Robert Shapiro, attorney to the stars, and Johnnie Cochran, who’s begun to see an effective angle into the case. Shapiro’s decision to defend his own reputation in a press conference rankles Cochran: “What a prick,” he says. “People, when you take these jobs, you are in service to your client. Never betray that individual.” In the last episode, Cochran showed little respect for Shapiro as a litigator, but this is a more fundamental violation — it’s not just that O.J. has poor representation, but no representation. Given Cochran’s role in the trial, as the diabolically charismatic leader of a “Dream Team” defense, “The Run of His Life” suggests a motive other than mere opportunism. He sees, in Simpson, a man who needs a better lawyer. For his part, Robert Kardashian is still more O.J.’s friend than his lawyer, and though David Schwimmer’s performance tiptoes on the edge of camp, it stays on the right side of the line. There’s a Hollywood tackiness to Kardashian that Schwimmer has to capture alongside genuine outpourings of distress. He’s confused and heartbroken by the situation; it has blindsided him, shaken his faith, and left him to question his friend’s motives and actions. At the same time, he’s still the narcissistic father of the Kardashian sisters, animated by privilege and a parasitic attachment to celebrity. When all of these elements combine, he’s the soul of the show. At once tragic and grotesque, Schwimmer’s Kardashian is the case in microcosm. Is Cuba Gooding Jr. any good in this role? I still have no idea, which is why I haven’t said much about him so far. There’s a lot of performance here, but not much in a lower register. That may be proper, given O.J.’s mental state at the time, but Gooding hasn’t added much dimension to the character. Yet. The jury is also out on John Travolta. The trouble with Travolta is that he’s not a character actor. 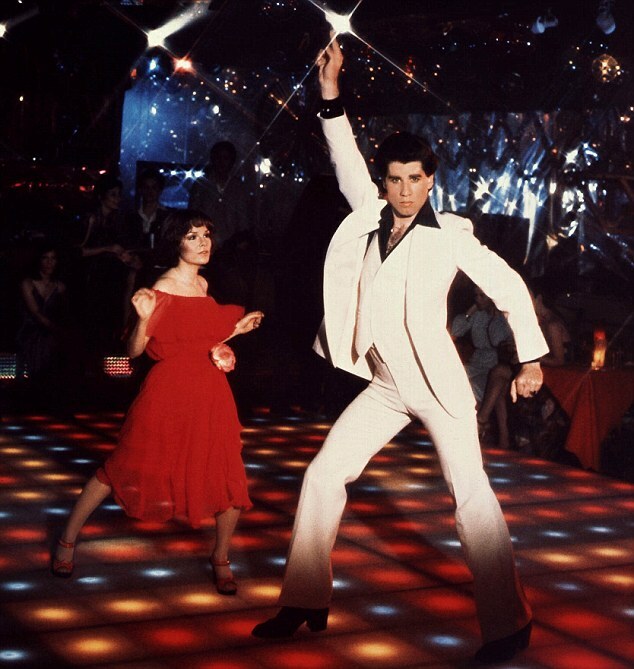 He can bring star charisma to a role that’s written within certain narrow parameters — Saturday Night Fever and Pulp Fiction being the obvious ones, each tailored to his talents like a white disco suit — but asking him to play a real person like Robert Shapiro is another story. Shapiro is a man fundamentally at ease — “a deal-maker,” as Cochran calls him — but Travolta looks visibly uncomfortable. That may be fine for these early looks at Shapiro, who still doesn’t have control of his client, but it’ll be a challenge for Travolta once the defense team becomes more disciplined. Brilliant use of the Beastie Boys’ “Sabotage” over footage of the initial white Bronco chase, before the freeway was closed and things slowed down. “Sabotage” was released just six months before — it’s really the only choice for any high-speed police chase that year. More playful incorporation of the Kardashian kids in this episode, as they delight in the attention their dad gets on TV without respect for the gravity of the situation. The more I consider The People v. O.J. Simpson as a comprehensive look at the case and its legacy, the more it makes sense that the Kardashians deserve a place in it, even if they didn’t play significant roles at the time. A chilling scene at the end of the chase, with the Bronco parked at the Brentwood estate and police surrounding the vehicle. Between cutting off the lights (“They don’t want us to see,” says Cochran) and one officer mistaking O.J.’s picture frames for a gun, we see how the distrust of the LAPD is well earned, particularly when it comes to African-Americans.